It’s no secret that your brand needs to connect with your audience and their personal lives to gain their loyalty and trust, but how many marketers base their strategies on assumptions and predictions? I’ll give you a clue: a lot. So now, I’ll tell you why looking backwards, at recent cultural trends of the past year or so, will grow your business much faster than any prediction will. Firstly, cultural marketing is incredibly relevant, it's in the very nature of the beast. Reach and awareness are forever increasing in volume, and it won’t be long until this information becomes redundant; the number of people who see your campaigns won’t matter but making sure the right people see the right assets will be more important than ever, especially as competition continues to increase. Cultural velocity is a must have in any marketer’s glossary, the term ‘cultural velocity’ refers to “the speed at which a brand interprets and responds to the cultural data signals to improve relevance to consumers and drive incremental business growth”. Recent figures show that brands with a higher cultural velocity have a 61% higher revenue growth than those with less, which is too staggering of a percentage to ignore. Even if you think you know your audience through and through, your assumptions could very well be wrong. Take a travel company marketing to retired holidaymakers- the assumption that has always been made was that retired people want to go on cruises and coach tours that aren’t too far-fetched or complicated. One company decided to delve a little deeper. They found that there has been a recent trend of the ‘Grey Gap Year’ and it was actually noticeably more prevalent, for those people who are newly retired, than the typical retiree tour. Grey Gap Years are cultural trips that last 6 or more weeks and that focus more on delving into unfamiliar cultures. These travellers’ personality traits, through this study, were found to be more similar to the 18-25yo traveller than anyone in between (in terms of their level of self-expression, affinity etc). This changed the way this travel company markets to their elderly travellers, and they are winning because of it. But why haven’t other travel companies followed suit? People love to make assumptions, and because of that, the stereotype of the elderly coach tour still reigns over anything else for most travel agencies. By looking at actual trends, facts and figures from the past year, you’ll be able to draw a detailed and accurate picture of your audience in terms of who they really are, as opposed to who you think they are, what they really want, not what you think they want and how they really live their lives, not how you think they live their lives. It seems pretty obvious now, doesn’t it? Here are a couple of our favourite examples of brands who are leading the way in using cultural trends to lead their marketing campaigns. This campaign launched the new Converse One Star range back in February 2018. The streetwear and sneaker trend was something that, in recent years, no one would have associated with the Converse brand, but this campaign has definitely changed that. They went deep into the subculture of modern street style, to pinpoint cultural trends that they could use in their campaign. Converse ignored their own beliefs about streetwear and instead focused on the reality of the trend and what that trend really means for its followers. They managed to study this in such an intricate way that the whole campaign felt completely real and relevant. They used other trends that came alongside that of ‘sneaker style’ to make this campaign as if it had come directly from the influencers of the subculture; they called in the most relevant artists and musicians to make it work, as well as a number of Instagram influencers. But, their consumer insights went even deeper than that. They used a multitude of tried and tested sneaker drop marketing techniques that have been seen before from other ruling brands in this sector like Supreme or Adidas. They started with social media teasers and followed these with a microsite detailing the big launch event. On their microsite, their use of colloquial language, tone and attitude was scarily accurate for this tongue in cheek audience. The really interesting part of this campaign was the launch event itself. In the biggest and most influential streetwear location of the UK, East London’s Shoreditch, Converse created the ‘One Star Hotel’. Their pop-up hotel included rooms curated by artists including A$AP Nast, Yung Lean and MadeMe, whilst the entertainment came from the likes of IAMDDB, Slowthai, Siobhan Bell and more. If you know anything about any of the artists above then you’ll know that they are the perfect fit. As well as two days of music, they also had workshops on skills like screen-printing and conversations about the social and cultural issues that are at the forefront of this audience’s minds. This campaign did a great job at tapping into the streetwear culture of East London, and the way they were able to pinpoint the best and most connected trends to the one they were targeting is the reason for it being such a huge success. Their December 2017 campaign focused on new year goals. Spotify is great at tapping into people’s behaviour and their end of year campaign in December 2017 proved just that. They created humorous digital and print adverts based on their consumer insights and data, the microsite they built off the back of these had impressive features like an interactive quiz covering users’ own listening habits and personalised playlists recommending music similar to what they already listen to. Their mix of methods in the creation of this campaign showed how deeply they understand their consumer and how they approach music. The ability to connect with individual aspects of music-listening culture and relay that data in a way that suits those specific users is brilliant and the scalability of it doesn’t give room to leave anyone out. This recent campaign represented the realities of makeup consumers. We loved how this campaign ignored the usual rules of makeup marketing and took a more modern and accurate take on the industry, and its consumers. 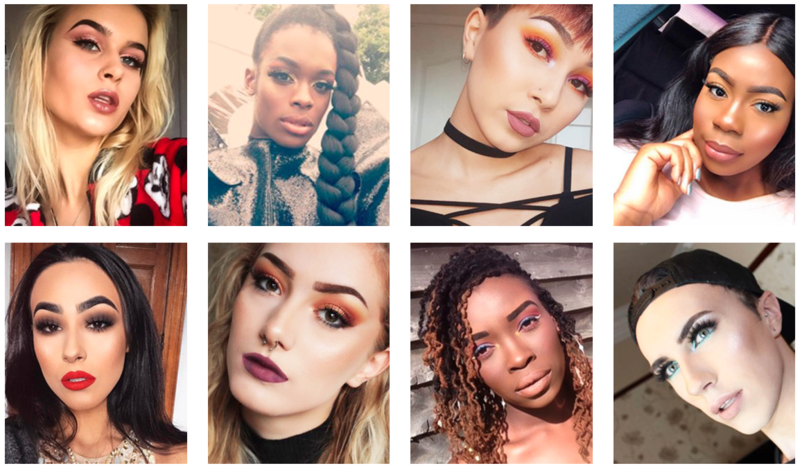 Other big makeup brands swear by their female models who wear the makeup and ‘wow’ anyone they come across. Sleek have realised that their own consumers aren’t those people, so why would they relate to that? My Face My Rules represents the makeup wearer as being as diverse as they actually are, not just the high fashion model type. The campaign features people of different ethnicities, genders, sexualities and even remembers that mums can love makeup too. But, the realistic approach doesn’t stop there, when these people put on their makeup and go out onto into the world, Sleek doesn’t shy away from the fact that makeup isn’t a magical tool to make people fall in love with you. Their video advert is great at showing the realities of makeup, it’s about confidence and expressing who you are, but it also shows a darker side to being bold with makeup. The campaign was based on a survey done by both Sleek MakeUP and Ditch the Label, an anti-bullying charity, who found that ⅓ have felt judged for the makeup that they wear. So here, they really are trying to highlight that no one can try and constrain self-expression, whether that be in the workplace or be that in the LGBTQ community, or even in the school playground. The advert shows people staring with raised brows at the makeup wearers whoever they are, and in return, they give back an ‘I don’t care what you think’ attitude. Take a look at the image below for some of the cast members or watch the full advert here. It’s a refreshing take on marketing makeup and beauty products and a much more realistic one at that. When a client approaches us about a new website design or marketing campaign, the first thing we suggest is an immersion session so that we can dedicate full resource to understanding the business. We always highlight the importance of understanding who the current end-user is, who the target end-user is and how we should be talking to them. We partner with DBS Data to ensure we can test the design, strategy and marketing decisions we make, ensuring our work isn’t based on assumptions. Struggling for ideas on how to connect with your audience? The process of creating two or more different types of pages or adverts is known as A / B, or Split testing. A proportion of your users and site visitors are shown one page, and a proportion a different version of the same page.